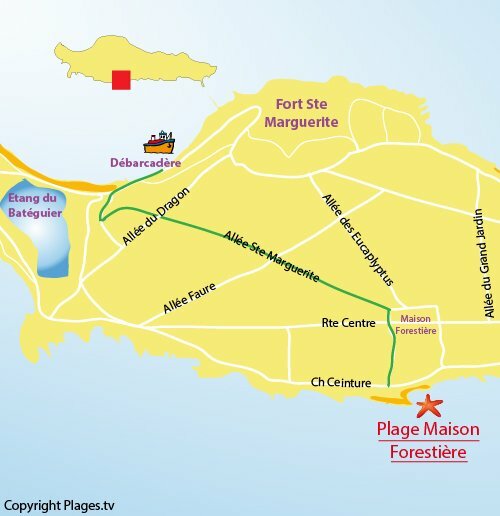 Facing the forest house of the island of Sainte-Marguerite, you'll find the largest beach of the island. On the left side and the central part, the beach is generally covered with a thin layer of Posidonia. The left part is pebblestones. 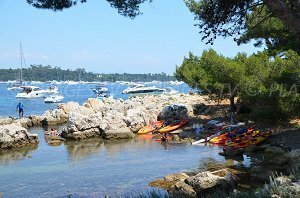 Swimming is on a mild slope and the view is pleasant of the island of St. Honorat as well as of the boats that are seen between the two islands. 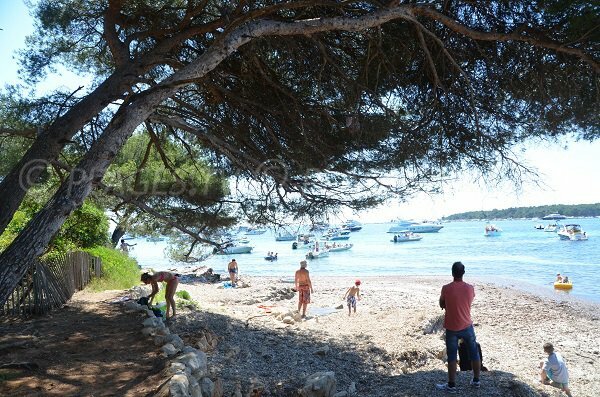 The beach is very narrow and you'll find according to the zone some shade under the pines. It is one of the most frequented beaches of the islands of Lerins, one must arrive very early in the morning to be able to choose a beach. The shortest route from the unloading stage is to turn to the right and then to the left at the fire station, then to turn again to the left on the allee de Ste. Marguerite. At the end of this one you'll turn to the right toward the shore. We are on the left side of the beach of the forest house of the island of Lerins. This part is less visited. We find here a small cove of Posidonia. In the background, it is the Esterel that we see with Theoule sur Mer. On the left is the island of St. Honorat (second island of Lerins) that we have with between the two islands numerous boats that come to shelter to take advantage of this magnificent landscape. It is on the central part that we find the most people. On this beach there is always a thin layer of Posidonia. On the left, the beach becomes more calm. Here we find pebblestones.